Our approach is more than just product based, it’s about crafting a unique solution around your clients. Designing that solution starts with listening, a critical step that opens a free flowing exchange of ideas, needs, requirements, and creativity. Every step in the Western Lighting & Energy Controls process is an experience in unparalleled clear collaboration. Our staff is dedicated to servicing our clients every step of the way. Click here for the latest information, including Manual downloads. Interested in Working For Western? Stay tuned to the latest from Western! Our Field Service Team is determined to make your installation a Success. Western’s Field Service Team is made up of qualified individuals dedicated to a project from start to finish. This team of highly trained technicians has been proudly servicing the Southern California community since 2016. The team comprises four field service operators and their manager, and are all United States Armed Forces Veterans, with extensive training in commercial and residential lighting and controls. 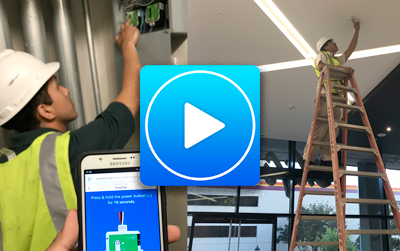 All team members are trained and certified to install and program Lutron products (Vive, GRAFIK Eye QS, Energi Savr Node). Click the video (left) for an introduction, and click here for details on the team. We are known for the company we keep.